Sign up for free and just shop with Make My Trip - Flights as normal. Our average member earns over ₹5900 cashback a year. In recent times, the name MakeMyTrip has become synonymous with online travel portal. Rated as the best online ticket booking and holiday package tour provider in India, the company was founded by Deep Kaira, an alumnus of IIM, Ahmedabad in the year 2000. In the inception, the portal started as travel agency mainly to provide services to overseas Indians working in the United States. However owing to its excellent service the company has grown up quickly to be an international full-fledged travel website within a short span of time along with over 65 retail stores across 50 cities in India and office in New York City, US, and Sydney, Australia. Headquartered in Gurugram (Gurgaon), Haryana, the services offered by the portal includes flight tickets, train bookings, bus bookings, hotel/home-stay reservation and booking on both domestic and international vacation packages. In recent times, MakeMyTrip has acquired its rival Ibibo, which is the largest merger in the history of online travel agencies in India. The value is estimated to be around $2 Billion with 60% of the stakes with MMYT shareholders and the rest to Ibibo shareholders. Interesting. Can you tell me more about MakeMyTrip services? MakeMyTrip flight Booking: The Company offers flight booking at the best prices. You can view flight fares, timings, and book as per your convenience from all the cities with an airport in India. It has a large database of all the airline providers including flight offers on Jet Airways, Indigo and Indian Airlines. Check out MakeMyTrip domestic flights coupon codes to avail the best price for your flight bookings. Planning to visit Bangkok or Dubai? No problem. The international flight roster is huge where you can book for destinations like Singapore, Colombo, Hong Kong, Kuala Lumpur and much more directly on the site. It also lists direct flights from India to all the airports in London, UK and New York. While you are checking out for the domestic flight offers, don’t forget to apply TopCashback promo codes to receive the highest cash back on domestic flights ticket booking. Start saving on your domestic flight bookings through TopCashback. You can save even more amount by making your domestic flight ticket booking payments through the digital payment wallet like Paytm, Amazon pay, Mobikwik wallets. MakeMyTrip Hotels: Booking hotels online made easy by MMYT as it presently holds close to 25% of the OTA hotel booking segment in India. You can book rooms starting from the high-end 5-star hotels and resorts to budget ones throughout India. Stay no worry about the cancellation charges. yes, The portal offers you zero cancellation charges on flights and hotel booking. Select awesome deals like “Book 2 Nights, Get 3rd Night Free” or up to 80% instant discounts on domestic and international hotels. Make sure to see our MakeMyTrip discount coupons for hotels to avail hundreds of more amazing offers and save on your money. You can get additional cash back if you are a user of ICICI, SBI, HDFC, CITI bank credit cards or Debit cards. Get huge discounts on domestic hotel booking through TopCashback and save more on your travel expenses. Holidays: The travel portal offers excellent value for money holiday packages for both domestic and international destinations. If you are planning to visit Singapore or Europe, make sure to check out the awesome travel packages offered by the company. Explore the exotic domestic travel destinations such as Ladakh, Himachal, Kashmir and neighboring countries like Bhutan and Sri Lanka to find peace and serenity from the chaotic urban life. If you are looking for a quick break in between your daily schedule and wish to have some fun camping or trekking check out the Weekend Getaway tours on the site. It also has a Grand 17 Night Tour of Europe which is considered as one of the best tours at the lowest price possible of an entire continent – so if you have always dreamed of traveling to the Alps or enjoy the artistry of the French, you know where to look for! Bus & Train Booking: The MakeMyTrip website boasts of providing the best prices for your bus ticket booking pan-India with base fares starting as low as Rs. 250. TopCashback provides excellent cashback on MakeMyTrip Bus booking and discount coupons which are valid on top of the existing MakeMyTrip promo codes. It also has a tag-up with IRCTC making train booking a very pleasant and smooth experience for you. Cab Booking: Arriving at the airport in the middle of the night or planning to take a road trip with your family or friends? No worries! Just sit cool and book a cab today with MakeMyTrip. Both local and outstation cabs available across 900+ cities on the portal including 24*7 customer support and breakdown assistance at exceptional prices. Avail the discount coupons to get up to Rs.300 off on booking prices too! Homestay: Who wants to stay in a top-notch hotel in an exotic location while you’re out on something exciting like trekking, mountain biking, beach hiking or photography spree. Check out these awesome homestay offers where you can stay and experience a homely environment while enjoying the beauty of your destination. MakeMyTrip App: The portal has a fantastically well designed mobile app for both Android and iOS which can be used to avail all their services and is exceptionally efficient. You can also earn up to Rs.7000 for free using their Referral Bonus using the application. Find some amazing daily deals and great travel stories that are updated on the mobile app daily basis. To use all these awesome services seamlessly download the mobile app from Google Play or iTunes Store. Why should I use TopCashback? TopCashback is the #1 cashback site in India offering the highest cashback and coupon deals. So if you wish to maximize your savings when you book a hotel, a flight or a vacation with MakeMyTrip make sure to use our offers. We are the only company in India providing 100% cashback to all our customers without any hidden charges at all and the best part is we are absolutely free to join and free to use. So what are you waiting for? Join us today and take a leap towards minimum spending and maximum fun! I’m impressed! So how can I start saving with TopCashback? 4. 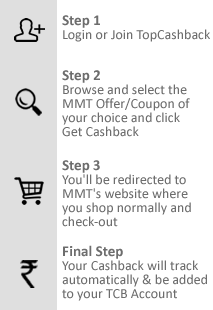 Click on “Get Cashback” and it will take you directly to the merchant page where you book normally, enter our exclusive MakeMyTrip coupon codes if applicable and check out. Once your order is successfully placed, your transaction gets tracked in your TopCashback Account and you’ll see that your cashback has been added in pending status. We do all the backend tracking and all technical activities while you book your service hassle free. So have fun! Get maximum discounts for all your flight and hotels online bookings at MakeMyTrip through TopCashback. You will also get assured highest cashback on any minimum booking amounts. What you are waiting for? Join TopCashback for free and start saving on your online travel booking expenses. 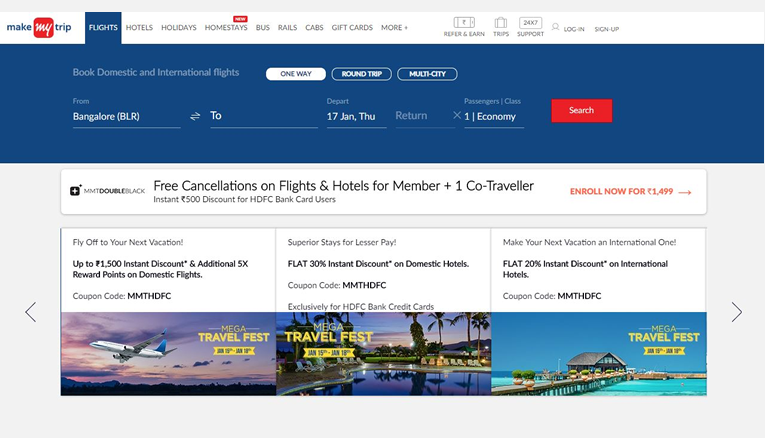 MakeMyTrip is one the India's premier online travel portals where a user can book flight tickets, hotels, bus, trains and look for a holiday package amongst thousands of beautiful destinations listed on the site. TopCashback offers the highest cashback on MMYT deals, so make sure to book with us to maximize yuour savings. The company has also launched it's Cab booking services in recent times olffering some amazing deals.